Q Acoustics reveals Concept 300, its ‘most progressive loudspeaker yet' | What Hi-Fi? 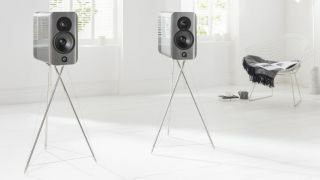 Building on the success of its flagship Concept 500 floorstanders (£3999/$5999), Q Acoustics has revealed the Concept 300, which the company says is its ‘most progressive loudspeaker yet’. The Concept 300s use the technological advancements of their siblings – Q Acoustics’ Dual Gelcore cabinet construction and internal P2P bracing, for example – and usher in specially designed drivers and new aesthetics. That Tensegrity tripod stand isn’t simply an eye-catching photoshoot prop – it’s an integral part of the Concept 300’s design, and a patent-pending innovation Q Acoustics appears to be quite pleased with. The load-bearing aluminium rods and thin stainless-steel cables are designed to efficiently reduce the transmission of external vibrations. Q Acoustics has essentially drawn on a concept by Buckminster Fuller from the early 1960s and applied it to couple speakers to stands and the floor in a more effective way than traditional spiked stands do. The self-supporting structure is made up of elements either in compression (tubes) or tension (cables) and aims to eliminate reflections through its low surface area. To further reduce unwanted vibrations, Q Acoustics has developed an isolation base plate system, integrated into the bottom of the cabinet, that mechanically ‘grounds’ the speakers. Each 14kg standmount rests on four damped springs, and vibrations are converted in the springs into heat through a polyurethane elastomer. The Concept 300 cabinet employs the same Dual Gelcore construction and internal P2P (Point-to-Point) bracing found in the Concept 500. The former is a non-setting gel that separates the three layers of MDF so that vibrations from driver movement are transmitted through the wooden layers and turned into heat. The bracing, meanwhile, is fitted to areas inside the cabinet that are susceptible to low frequency reverberations which can degrade performance. The new 16.5cm mid/bass drive units use a paper cone, a new rubber surround that helps reduce unwanted cone resonance, and a glass fibre voice coil for higher power handling and reduced dynamic compression. The magnet has been enlarged over those fitted to the twin drivers in the Concept 500, too, helping to provide better control for a single driver in a smaller cabinet. The 2.8cm soft dome tweeter features the wide-dispersion technique and decoupled isolating mount developed for the Concept 500, the latter protecting the tweeter from vibrations, allowing it to be placed nearer the mid/bass driver for improved integration. A sophisticated and stylish dual finish, combining real wood veneers with multiple gloss lacquer, means the Concept 300s look like a class act - one which befits their price tag, if you ask us. There are no exposed screws spoiling an otherwise elegant design either. The Concept 300’s mid/bass driver unit is held in place from behind by spring-tensioned retaining bolts. These allegedly also keep torque constant, so there won't be any problems with traditional screws or bolts loosening over the years due to vibration in the speaker cabinet. The Q Acoustics Concept 300s (including the Tensegrity stand) come in three different finishes (silver/ebony, gloss black/rosewood, and white/oak), and are available from March, priced £2999/$4499.